Extermination camps (death camps) were built by Nazi Germany during World War II. The goal of the death camps was to kill millions of people as quickly as possible. At the death camps, people were murdered mostly by being given poison gas in gas chambers. However, the Nazis also killed many people in other ways at the death camps. They killed some in mass executions (for example, by shooting many people at once). They killed others through "extermination through labor." This was by making prisoners do very hard forced labor without giving them the food, medical care, or other basic things they needed to survive. Many other people died at the death camps from starvation, illness, and freezing to death. The Nazis sent many different kinds of people to the death camps. However, about 90% of the people killed in the death camps were Jewish. Nazi Germany wanted to 'exterminate' the Jewish people (they wanted to kill all of the Jews, so they would not exist any more). This plan was called the Final Solution. It is now called the Holocaust. The fascist Ustaše government in the Independent State of Croatia also set up death camps during World War II. At death camps like Jasenovac, they murdered many Serbs, Jews, and other people. As many as 750,000 Serbs may have been killed at these death camps. The Nazis believed that some groups of people were better than others. They thought that the Aryan race was the best of all. They believed that people who were not "Aryan" were "inferior". They also believed that non-Ayrans were the cause of Germany's problems. They thought that some groups of people did not even deserve to live. These groups included people with disabilities. The Nazis called these people Lebensunwertes Leben - "life unworthy of life." In 1939, the Nazi Schutzstaffel (SS) started a program to kill everyone who was "unworthy of life." They called this secret program the Action T4 euthanasia program. As part of this program, they killed 70,000 people with disabilities, using carbon monoxide gas. This was the first time the Nazis had used poison gas to kill people. Two years later, the Nazis built the first death camps. Using the things they learned by gassing people with disabilities, the Nazis had decided to start the Final Solution - killing all of the Jewish people, mostly by gassing them. Before the Nazis were ready to kill large numbers of people in gas chambers, the SS Einsatzgruppen started killing many people at a time by shooting them. At the Wannsee Conference in January 1942, the Nazis made it clear that they planned to kill all the Jews in Europe. Adolf Eichmann was put in charge of this program. After this, the Nazis built more death camps, with the goal of killing millions of Jewish people with poison gas. Members of the Sonderkommando burn corpses at Auschwitz II-Birkenau. The Nazis used death camps and concentration camps for different things. The goal of the death camps was genocide. Their purpose was to kill people who were sent to the camps on trains, thousands at a time. At death camps like Bełżec, Sobibór, and Treblinka, people were usually killed within a few hours after they got to the camps. Concentration camps were different from death camps. Some of the more infamous concentration camps were Buchenwald, Bergen-Belsen, Dachau, and Ravensbrück. These were prison camps which the Nazis set up before World War II started. The Nazis sent people who they did not want in their society to these concentration camps. The Nazis forced millions of people to do forced labor in the concentration camps. Prisoners in concentration camps made up about 25% of the workers in Nazi Germany. Even though the concentration camps were not designed for mass murder, over 75% of the people sent to these camps died because of starvation, illness, exhaustion, executions, and physical abuse. In the early years of World War II, the Jews were mostly sent to concentration camps. However, from 1942 onward, they were mostly deported to the death camps. They were told they were being "resettled" - sent to other places to live. The Nazis built many of the death camps in Poland, which the Nazis controlled. They did this because most of the people they wanted to kill lived in Poland. Poland had the most Jewish people in the parts of Europe that the Nazis controlled. Also, since these death camps were not in Germany, the Nazis could hide what they were doing from the German people. The Nazis created two types of death camps. Some were "pure extermination camps." Their only purpose was to kill people. Others were a combination of concentration camps and death camps. At these camps, the Nazis would kill some people right away. They would force others to work as slaves until they died. The first death camps were Treblinka, Bełżec, and Sobibór. They were built during Operation Reinhard (October 1941 – November 1943), whose goal was to kill all of Poland's Jews. 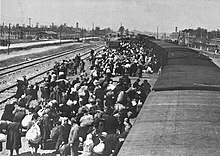 Trains full of people were sent to these camps, and were murdered as soon as they got there. At first, the camp's guards used carbon monoxide to kill the prisoners. They then buried their bodies in mass graves. Later, when there were too many bodies to bury, they started burning the bodies. So they could kill people and get rid of their bodies more quickly, the Nazis built gas chambers and crematoria in Treblinka and Bełżec. At Bełżec, they also started using Zyklon-B poison gas to kill people. On December 8, 1941, the Nazis opened another death camp called Chełmno. At first, they killed prisoners at Chelmno inside vans, using carbon monoxide exhaust fumes. Later, like at the other death camps, the Nazis built gas chambers so they could kill more people at a time. Almost all of the prisoners sent to Chelmno were killed right away. However, the Nazis forced a few strong men into work units called Sonderkommando. These prisoners were forced to help take dead bodies out of the gas chambers and burn them. The death camps were small (only several hundred meters long and wide). They also had very little housing or other buildings. Because of this, the Nazis were able to trick the prisoners when they arrived. The Nazis told them they would only be staying at the camp for a short time, before continuing to a work camp farther east. This kept the prisoners from panicking or fighting back. After they decided to start the "Final Solution," the Nazis built gas chambers and crematoria inside some of the concentration camps that already existed, like Auschwitz and Majdanek. When people arrived at these camps, they would go through a process called "selection." Nazi guards would choose which prisoners would be kept to work as slaves, and which would be sent right to the gas chambers to be killed. Usually, the Nazis sent elderly people, sick people, and very young children right to the gas chambers. Healthy people were often kept for slave labor, and were forced to work until they were too sick or starved to work as fast as the Nazis wanted. Then the Nazis would "select" them for the gas chambers. With the support of Nazi Germany and fascist Italy, the Independent State of Croatia (ISC) was created on 10 April 1941. It was ruled by the fascist Ustaše government, which agreed with the Nazis' ideas about race and politics. The Ustaše agreed with the idea that all Jews and Roma people should be killed. They also agreed with the Nazis that socialists and communists were political enemies. The Ustaše built death camps in the Independent State of Croatia and helped with the Nazis' "Final Solution" by killing many Jews and Roma. However, their main goal was to kill all of the Serbian people in the ISC. The Ustaše treated the Serbian people so cruelly that even the Germans were shocked. The first Ustaše camp was Jadovno concentration camp. It held thousands of Serbs and Jews from May to August 1941. Prisoners were usually killed by being pushed into deep ravines near the camp. The Jasenovac concentration camp replaced Jadovno. Jasenovac was a very large group of many camps. Many prisoners who arrived at Jasenovac were immediately scheduled to be killed. Strong men who could work, and were sentenced to less than three years in the camp, were allowed to live. However, all prisoners sentenced to three years or more were immediately scheduled for execution. Some prisoners at Jasenovac were killed with poison gas or in mass shootings. However, the Ustaše guards killed many prisoners using their hands, or tools like knives and hammers. Carpathian Ruthenian Jews arrive at Auschwitz–Birkenau, May 1944. Most were killed in gas chambers hours after arriving. In 1941, top Nazi official Heinrich Himmler went to see a group of Einsatzgruppen perform a mass shooting. The group's commanding officer told him that shooting so many people was psychologically harming the soldiers doing the shootings. Himmler decided the Nazis needed to find another way of killing people. After the war, the diary of Auschwitz's Commandant, Rudolf Höss, showed that many Einsatzkommandos – the killers – either went mad or killed themselves. He wrote that they did this because they were psychologically "unable to endure wading through blood any longer." The Nazis had learned from their T-4 program that they could kill people using carbon monoxide. However, they thought sending carbon monoxide to the death camps would be too expensive. 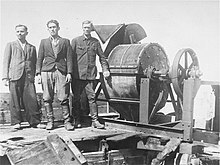 In August 1941, Höss' deputy, Karl Fritzsch, tested out an idea. At Auschwitz, clothes infected with lice were treated with crystals of prussic acid (hydrogen cyanide). The crystals' brand name was Zyklon-B. They were made to order by the IG Farben chemicals company. Once their container was opened, the Zyklon-B crystals in the air released a deadly cyanide gas. Fritzch thought this gas could be used to kill prisoners. To try out the effects, he locked some Soviet prisoners of war in the basement of a bunker and gassed them. They died. Gassing with Zyklon-B became Auschwitz's way to exterminate people. It would also be used at Majdanek and other camps. Besides gassing, the camp guards continued to kill prisoners through mass shootings, starvation, torture, and abuse. To keep people from panicking and fighting back, the Nazis told the prisoners they were going to shower and get deloused (get lice removed). Prisoner Sonderkommando were forced to help in and around the gas chambers. They encouraged the Jews to undress without a hint of what was about to happen. (If the Sonderkommando warned the prisoners, they too would be killed.) The gas chambers were designed to look like shower rooms (with fake water nozzles, and tile walls). The Sonderkommando talked to the victims about life in the camp to keep people from getting suspicious. They also helped the elderly and the very young to undress. The Sonderkommando also comforted older children who might cry "because of the strangeness of being undressed in this fashion". Once the gas chamber was full of people and the door was sealed, Nazi guards dropped Zyklon B through special holes in the roof. Fifty two crematorium ovens, including these, were used to burn the bodies of up to 6,000 people every 24 hours during the operation of Auschwitz-Birkenau gas chambers. As part of their training, some high-ranked Nazi Party leaders and SS officers were sent to Auschwitz–Birkenau to watch the gassings. Höss reported that "all were deeply impressed by what they saw ... [but some] ... who had previously spoken most loudly, about the [need] for this extermination, fell silent once they had actually seen the 'final solution of the Jewish problem'." After the gassings, the Sonderkommando removed the corpses from the gas chambers, then took gold teeth out of the bodies. At first, the victims were buried in mass graves. Later, victims' bodies were cremated. The ashes were either buried, scattered, or dumped in a nearby river. Hess wrote that he was impressed by how hard the Sonderkommando worked, even though they knew they would also be killed eventually. Eventually, the Nazis were killing so many people at Auschwitz-Birkenau that they had three buildings with crematoria designed by specialists from Topf und Söhne. At Auschwitz, prisoners worked every hour of the day to destroy corpses. However, people were being gassed so quickly that not every body could be destroyed in the crematoria. Some corpses were also burned in an open air fire pit. At Sobibór, Treblinka, Bełżec, and Chełmno, the corpses were burned on pyres. When they realized they were going to lose World War II, the Nazis tried to destroy the death camps in order to hide the evidence of what they had done. They wanted to hide evidence that so many people had been killed. This meant they needed to destroy the camps, and also hide the corpses of their many victims. The Nazis forced prisoners to destroy the camps and their records, and to dig up mass graves. Some extermination camps were liberated (taken over and freed) by Soviet soldiers before the Nazis could destroy evidence of their war crimes. For example, Majdanek was captured nearly intact before the Nazis were able to destroy very much. This happened because the Soviet Red Army got to the camp very quickly, which prevented the SS from destroying most of the camp. ↑ 1.0 1.1 Yad Vashem. "The Implementation of the Final Solution: The Death Camps". The Holocaust. Yad Vashem The Holocaust Martyrs' and Heroes' Remembrance Author e=2015. Retrieved 15 September 2015. ↑ 5.0 5.1 Dr. Birgit Bock-Luna (2007). Serbian 'holocaust' in: The Jasenovac debate. The Past in Exile. LIT Verlag Münster. 155, Note 102. ISBN 3825897524. Also in: Genocide and Fascism; The Eliminationist Drive in Fascist Europe by Aristotle Kallis, Routledge, New York, NY 2009, pages 236-244. ↑ Michael Burleigh (1994). Death and Deliverance: 'Euthanasia' in Germany, c. 1900 to 1945. CUP Archive. ISBN 0521477697. ↑ 8.0 8.1 8.2 Yad Vashem (2013). "Aktion Reinhard" (PDF). Shoah Resource Center, The International School for Holocaust Studies. Document size 33.1 KB. Retrieved 15 September 2015. ↑ Longerich, Peter (2010). Holocaust: The Nazi Persecution and Murder of the Jews. Oxford; New York: Oxford University Press. p. 185. ISBN 978-0-19-280436-5. ↑ Minerbi, Alessandra (2005) . A New Illustrated History of the Nazis. Rare Photographs of the Third Reich. UK: David & Charles. pp. 168-. ISBN 0715321013. ↑ George H. Stein. The Waffen SS. SS-Totenkopfverbände. pp. 9, 20–33. ISBN 0801492750. Retrieved 7 October 2015. ↑ Ulrich Herbert (1997). Hitler’s Foreign Workers: Enforced Foreign Labor in Germany under the Third Reich. The Army of Millions of the Modern Slave State (extract). Cambridge University Press. Retrieved 7 October 2015 – via Internet Archive; Univ of the West of England, Faculty of Humanities; compiled by Dr S.D. Stein. ↑ "The evacuation of Jews to Poland", Jewish Virtual Library.'.' Retrieved 28 July 2009. ↑ Ellen Land-Weber, "Conditions for Polish Jews During WWII" in To Save a Life: Stories of Holocaust Rescue.'.' Retrieved 28 July 2009. ↑ 18.0 18.1 See: M. Lifshitz, "Zionism" (משה ליפשיץ, "ציונות") p. 304. Compare with H. Abraham, "History of Israel and the nations in the era of Holocaust and uprising (חדד אברהם, "תולדות ישראל והעמים בתקופת השואה והתקומה")"
↑ Grossman, Vasily (1946), The Treblinka Hell [Треблинский ад] (PDF file, direct download 2.14 MB), Moscow: Foreign Languages Publishing House, retrieved 5 October 2014, original in Russian: Гроссман В.С., Повести, рассказы, очерки [Stories, Journalism, and Essays], Воениздат 1958. ↑ M. Shelach (ed. ), "History of the holocaust: Yugoslavia". ↑ Cox 2007, p. 225. ↑ "Nazi Collaborators", Yesterday TV, UK, 12.00, 11 Jan 2014. ↑ Tomasevich, Jozo (2001). War and Revolution in Yugoslavia, 1941–1945: Occupation and Collaboration. Stanford, California: Stanford University Press. ISBN 978-0-8047-3615-2. ↑ Hoss [sic], Rudolf (2005). "I, the Commandant of Auschwitz," in Lewis, Jon E. (ed. ), True War Stories, p. 321. Carroll & Graf Publishers. ISBN 978-0-7867-1533-6. ↑ Borkin, Joseph (1978). The Crime and Punishment of IG Farben. New York: Free Press. ISBN 978-0-02-904630-2. ↑ Höss, pp. 164-165, 321–322. ↑ Höss, pp. 164-165, 322–323. ↑ Holocaust Encyclopedia (20 June 2014). "Gassing Operations". The means of mass murder at Auschwitz. United States Holocaust Memorial Museum. Retrieved 12 July 2015. ↑ 35.0 35.1 35.2 Höss 1959, p. 168. ↑ Berenbaum, Michael; Yisrael Gutman (1998). Anatomy of the Auschwitz Death Camp. Indiana University Press. p. 199. ISBN 978-0-253-20884-2. ↑ A recent study reduced the estimated number of deaths at Majdanek, in "Majdanek Victims Enumerated", by Pawel P. Reszka, Lublin, in the Gazeta Wyborcza 12 December 2005, reproduced on the site of the Auschwitz–Birkenau Museum, Lublin scholar Tomasz Kranz established that figure, which the Majdanek museum staff consider authoritative. Earlier calculations were greater: ca. 360,000, in a much-cited 1948 publication by Judge Zdzisław Łukaszkiewicz, of the Main Commission for the Investigation of Nazi Crimes in Poland; and ca. 235,000, in a 1992 article by Dr. Czesaw Rajca, formerly of the Majdanek museum. ↑ Yad Vashem, "Maly Trostinets" (PDF). Retrieved 1 September 2013. ↑ At the Maly Trostenets extermination camp in Belarus, USSR, some 65,000 Jews were murdered according to Yad Vashem (PDF file, direct download) whilst the estimated number of 200,000 people perished in the Trostenets area. See also: Yad Vashem overview. Internet Archive. ↑ In all, the Germans and their auxiliaries killed at least 170,000 people at Sobibór. Holocaust Encyclopedia. ↑ The Höfle Telegram indicates some 700,000 killed by 31 December 1942, yet the camp functioned until 1943, hence the true deaths total likely is greater. "Reinhard: Treblinka Deportations". Nizkor.org. Retrieved 20 December 2012. ↑ Holocaust Encyclopedia, NAZI CAMPS. United States Holocaust Memorial Museum. ↑ Terese Pencak Schwartz, The Holocaust: Non-Jewish Victims. Jewish Virtual Library. ↑ 47.0 47.1 Arad, Yitzhak (1984), "Operation Reinhard: Extermination Camps of Belzec, Sobibor and Treblinka" (PDF), Yad Vashem Studies XVI (Internet Archive)|format= requires |url= (help), pp. 205–239 (26/30 of current document), The Attempt to Remove Traces.